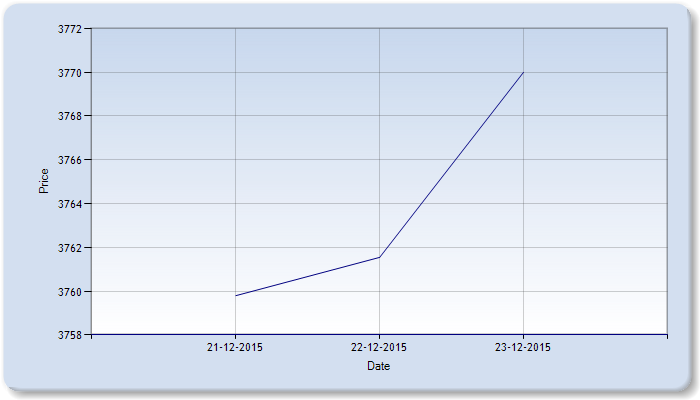 With castor contracts being suspended by NCDEX from January 27, daily volumes of the commodity have moved up sharply on the regional Rajkot Commodity Exchange. The volumes have increased from 920 tonnes to 5310 tonnes in two weeks. There are 101 registered members in RCX but only 12 are active. Activity of non-members has increased in recent times which also reflects on the increased volumes. National Commodity and derivatives Exchange has planned to assist castor seed traders in liquidating their stock through its e- spot market arm, NCDEX eMarkets Ltd. (NeML). 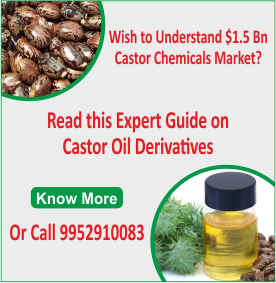 Through NeML castor seed traders can liquidate their entire holding in a phased manner instead of carrying the entire quantity and go the physical market for selling. Selling through a spot exchange might yield better realization than transporting entire quantity to physical markets on one occasion. The closing price for last week was Rs. 3486.35/quintal. 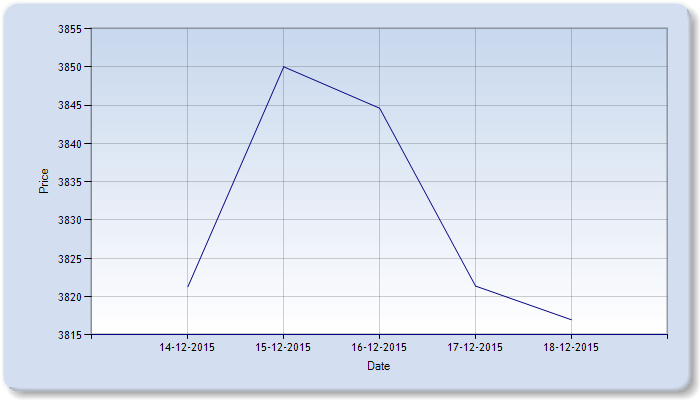 This week, a decrease in price of castor seed was observed throughout the week. 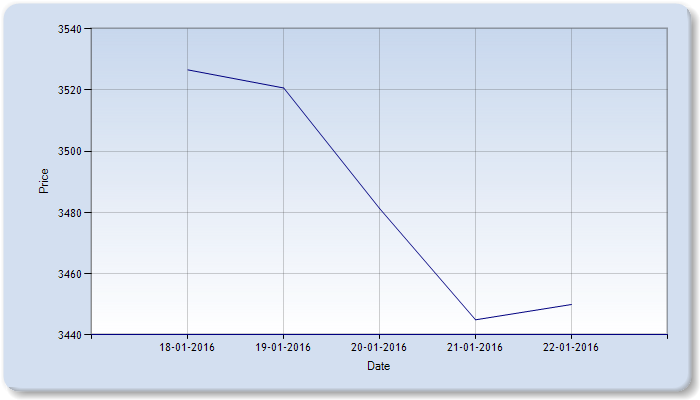 In general, a decrease in the price of castor seed was observed at the end of the week compared to previous week. The closing price for last week was Rs. 3651.9/quintal. 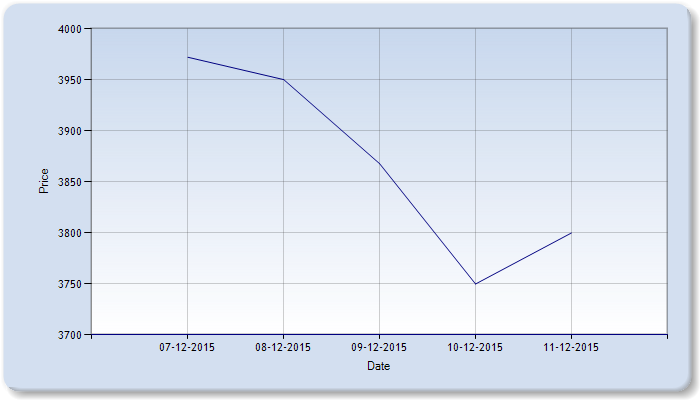 This week, a decrease in price of castor seed was observed throughout the week. 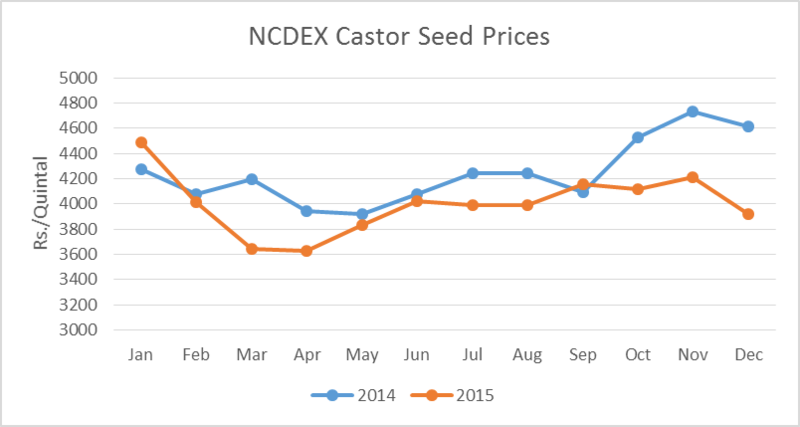 In general, a decrease in the price of castor seed was observed compared to previous week. The closing price for last week was Rs. 3726.65/quintal. 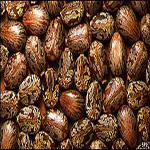 This week, a decrease in price of castor seed was observed at the end of the week. 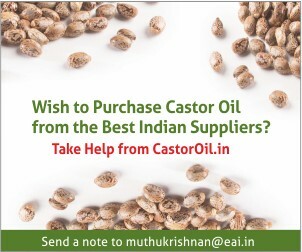 Castor seed prices have traded in the range of Rs. 3600 – Rs. 4200/quintal in 2015. 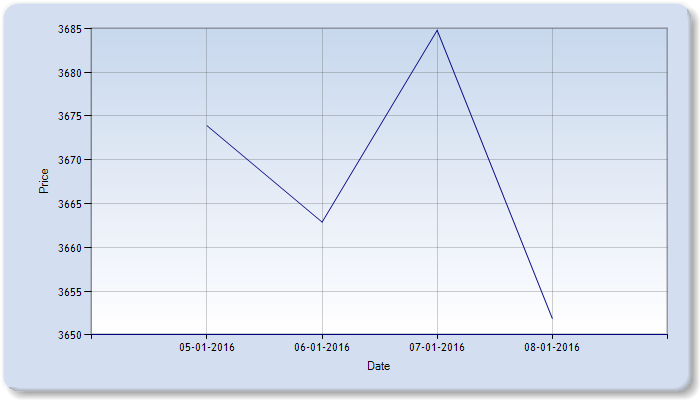 The prices have remained range-bound till October due to a comfortable supply situation. The week rupee and lower prices led to healthy demand and hence the seed prices increased to Rs. 4200/quintal in November, tracking good export demand to China and EU in the latter half of the year. The average prices for each month are presented below. Starting with a high of Rs 4500/quintal, the lowest price reached during the year (about Rs 3600/quintal) is almost 20% lower than the highest price during the year. Even though the price almost touched Rs 3600/quintal during 2015, we can see that it has remained almost at or above Rs 4000/quintal for most of the months (9/12 months, it has been Rs 3900 and above), so one can say that Rs 40/Kg (and for a few months above 40) was the dominant price of castor seeds during 2015. In 2014, though the prices have started off at a price lower than 2015, the price trend has remained somewhat stable during February to June compared to 2015. During the end of the year, in the months of Oct to Dec, the prices have reached very high compared to 2015. The prices have been above Rs.40/kg except for two months. When we compare the yearly average prices, the average price for 2014 is Rs.4245/quintal, while that for 2015 is Rs.4002.1/quintal which shows a 5.7% reduction in price in 2015. The closing price for last week was Rs. 3770/quintal. This week, a decrease in price of castor seed was observed throughout the week. 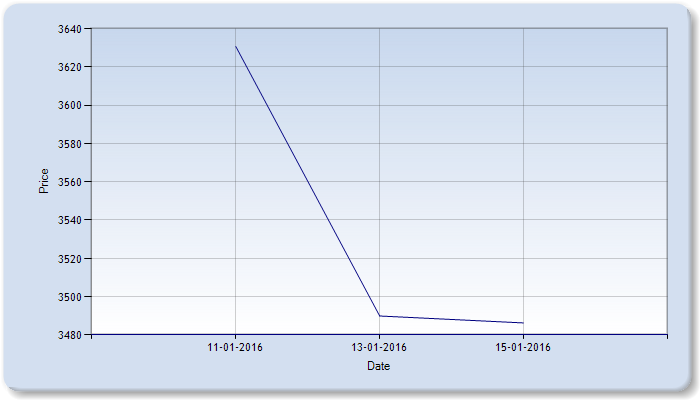 In general, a gradual decrease in the price of castor seed was observed compared to previous week. The closing price for last week was Rs. 3817/quintal. 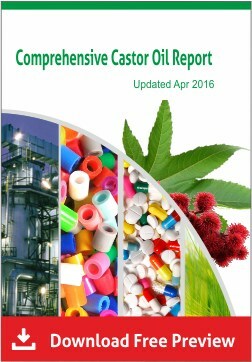 This week, an increase in price of castor seed was observed throughout the week.